Roughly 150 migrants attempted to climb over or crawl under the U.S.-Mexico border fence into California in a clash with U.S. Customs and Border Protection agents involving rocks and tear gas, the agency said. Agents first discovered a group of 45 migrants in San Diego Monday night due to CBP’s increased presence at the border, following the ongoing migrant caravan. The few dozen migrants were then turned back toward Mexico, CBP said. Shortly after, migrants began throwing rocks over the fence at CBP agents and officers, said authorities. Agents said several teenagers were put over the fence’s barbed wire in heavy jackets and blankets. The agency said it couldn’t assist the children attempting to cross the border because of the rocks being thrown at its officers. Agents deployed smoke, pepper spray, and tear gas to stop the rock throwers, according to CBP. 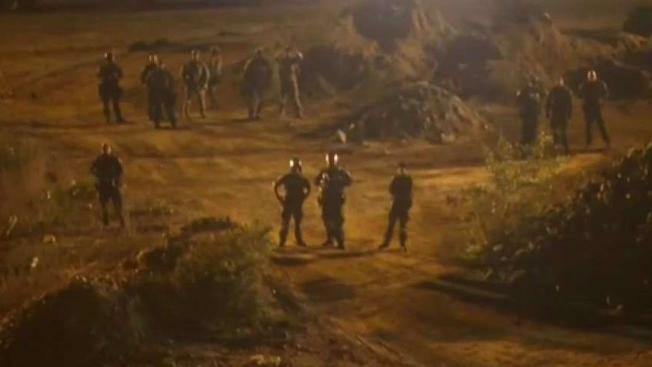 These deployments were directed at the rock throwers and not at the migrants trying to cross the border in a separate area, the agency said. “No agents witnessed any of the migrants at the fence line, including children, experiencing effects of the chemical agents, which were targeted at the rock throwers further away,” CBP said. It affected the migrants, including women and children, as well as members of the press, according to AP. The gases eventually stopped the people from throwing rocks, and they fled. CBP said “most” of the migrants attempting to enter the U.S. returned to Mexico. The agency apprehended 25 migrants, including two teenagers, CBP said.